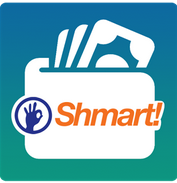 1.First Click Here to download Shmart Wallet app. 3.Now Click on menu on top left side There Add money. 5.After adding money initiate Recharge of 300 or More. 6.Pay amount Through you wallet. Note : There is no facility for apply coupon in app for avail any cashback offer.To avail this offer you have to add money in your wallet first then recharge with this wallet amount. 7.Cashback of Rs 50 will be added within 72 hours. 1.Offer is valid on August21,2015 12:00:00hrs to August23,2015 23:59:59hrs. 2.A user can avail this offer Total 10 times,but 5 times per day. 3.For Eligible this cashback offer you have to add money in your wallet first,then pay with this wallet. 4.Recharge transactions done directly through Payment Gateways (Credit Card/Debit Card/ Net Banking) and Hybrid (Wallet + Credit Card/Debit Card/ Net Banking) will not qualify for this Offer, even if the amount is equal to or greater than Rs. 300 (Rupees Three Hundred).